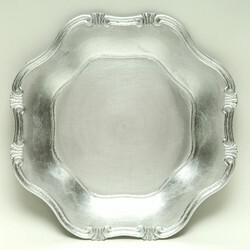 ChargeIt by Jay Baroque Silver Charger Plate 13"
Home > Products > ChargeIt by Jay Baroque Silver Charger Plate 13"
Give your everyday dinnerware an upscale makeover with the ChargeIt by Jay Silver Baroque Charger Plate 13".Boasting an intricate design with scalloped edges, this brilliant silver charger plate adds a simple yet timeless charm to any table setting. Providing the perfect harmony of style and durability, this charger is made from premium quality melamine that provides unbeatable durability. Perfect for presenting multi-course meals, this charger complements any upscale table setting and accommodates any size plate. To properly clean this charger plate, hand washing is highly recommended.